Don’t let wasted capacity hurt the efficiency of your compressed air system. Gain control of your compressed air system and operate much more efficiently with CAMLink™ Micro. The CAMLink™ Micro, like everything in the CAMLink™ line, provides your facility with significant savings in the form of a more efficient and effective compressed air energy system. Contact CAM Technologies today to learn more. Industrial and manufacturing facilities that utilize compressed air energy systems frequently struggle with controlling system efficiency. Compressed air systems often maintain too much capacity online as they attempt to both prevent pressure from dropping below critical levels and satisfy peak demands. The result of this wasted capacity is unusually high compressed air energy usage. The cost of compressed air can be up to 10 times as much as electricity. Compounding the problem is the fact that differences in pressure set points, pressure switch deadbands and pressure losses make it extremely difficult — if not impossible — to coordinate the multiple compressors required for optimal compressed air energy efficiency. CAMLink™ compressed air automation systems solve this problem by coordinating all air compressors and using the minimum number of compressors to trim the demand changes. CAMLink™ systems monitor changes in the supply and plant pressures to 0.01 PSI and quickly respond to the rate of pressure change by either adding or removing compression capacity. The system controls the unloaded cool-down time and stops the compressor as fewer compressors are needed, providing better regulation of capacity and prevention of wasted energy. The result for manufacturing and industrial facilities is a much more efficient compressed air energy system because far less energy is wasted throughout the day. When you operate your facility with the help of the CAMLink™ system, you will run it with lower pressure, realizing substantial savings in more ways than one. Lower energy costs are only the beginning in terms of what you’ll be saving with the CAMLink™ systems on your side. With the right mechanical systems in place, CAMLink™ controllers can be tailored to meet broader system demands, while at the same time recognizing multiple compressor dynamics and unique application requirements. 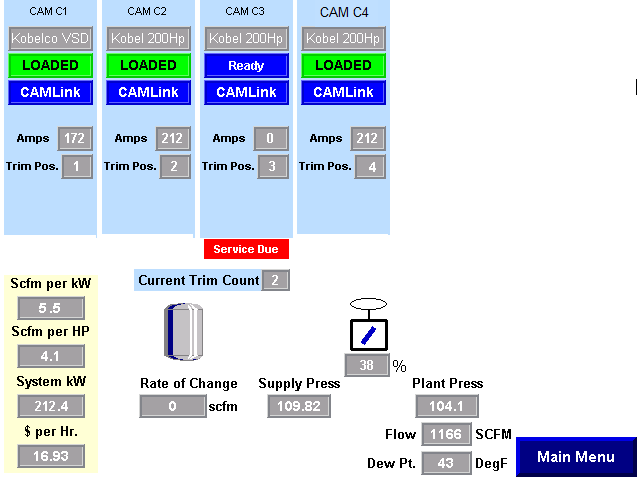 When it comes to managing the efficiency of small systems, facility managers and engineers turn to CAMLink™ Micro. This control system provides customized efficiency to the compressed air system and makes a positive impact on an industrial facility’s energy savings. CAMLink™ Micro is designed to support up to four rotary screw compressors. 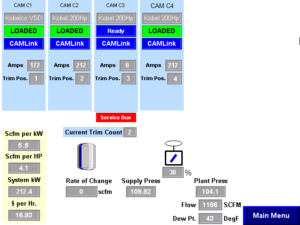 It has the flexibility to support the CAM Demand Expander™ along with other measuring devices such as flow meters and dew-point monitors; and remote monitoring, data collection, analytics and support can be added through the CAMLink Online service. The system automatically adjusts the number of compressors running or loading to meet a facility’s current air demands. Don’t let wasted capacity hurt the efficiency of your compressed air system. Gain control of your compressed air system and operate much more efficiently with CAMLink™ Micro. The CAMLink™ Micro, like everything in the CAMLink™ line, provides your facility with significant savings in the form of a more efficient and effective compressed air energy system. Contact CAM Technologies today to learn more.